So, here we have the lineup for this Friday’s Portsmouth Short Film Night, which is being hosted by White Heron Tea & Coffee at 601 Islington Street, Portsmouth NH. The screening starts at 7pm, so make sure you arrive in plenty of time to get a tasty hot drink! We have seven fantastic films scheduled for the evening, including five from local filmmakers. The selection includes documentaries, drama, comedy, thriller and animation. We try to bring something a little different to the movie scene here in Portsmouth, highlighting great local talents whilst also bringing otherwise unseen films to your screen. I am particularly excited to be showing Santa Always Checks Twice, a seasonal film noir comedy, and I Live Here, a film documenting the project of the same name where students from Salem, MA discuss difficulties in their lives prior to graduating. We have also selected a quirky animation and an award-winning psychological thriller from European filmmakers that highlight amazing indie filmmaking. We will have Q&A sessions after the local films so that you get a chance to chat with the filmmakers about their work past, present and future. It feels wonderful to be able to show so much local talent, and we are ending the night with local filmmaker Brian Goding’s recent documentary Shoot the Pier. It tells the story of Maine surfers in the 1960s using original Super 8 footage teamed up with modern-day interviews with the stars of the film. It’s great to see a slice of local history that’s so important to this area. Then, if that wasn’t enough, the night will end with a special intimate performance by Jonathan Blakeslee and his band Tiger Belly, giving the filmmakers and the audience an opportunity to chat, grab another hot drink from our hosts and relax after a great night of cinema. 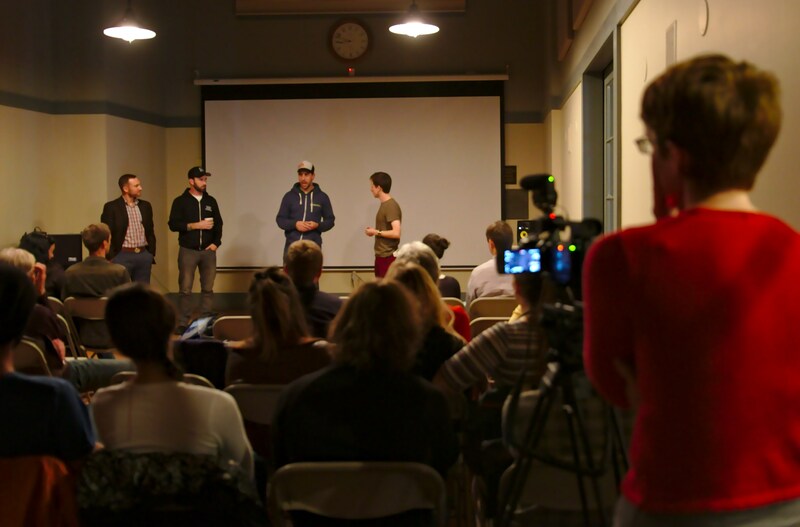 Portsmouth Short Film Night is a regular event produced by Film Unbound in collaboration with 3S Artspace. 3S Artspace, a 501(c)3 non-profit, is dedicated to presenting and supporting contemporary artists and their work in order to stimulate the artistic community and creatively engage and educate the public at large, while establishing a vital and accessible regional gathering space. Although its program of events continues to run in a variety of venues, it will be fully realized in 2014 with a 400-capacity performance space, gallery space and farm-to-table restaurant. Film Unbound is a media production company creating self-produced fiction, documentaries and tailor-made film solutions for clients including PromoDocs, event coverage and product demonstrations. We hope to see you at this festive, final PSFN of the year!